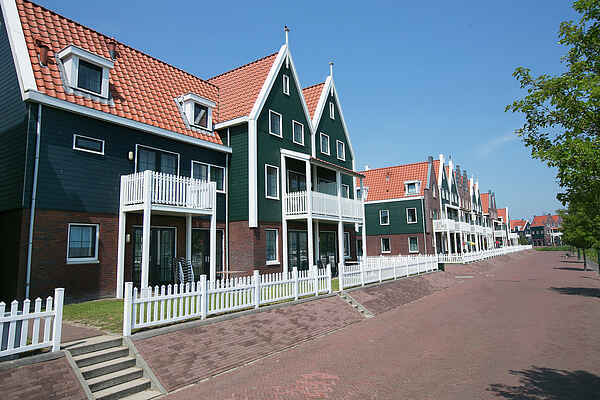 The group accommodations at Marinapark Volendam come in two spacious variants: an 11-person (NL-1131-07) and a 12-person (NL-1131-06). Type NL-1131-07 (167 m2) is a link-detached home spread across three storeys. The entryway is on the ground floor. You have three bedrooms on the first floor and a sleeping loft on the second floor. There are two bathrooms as well as a balcony and a garden with a terrace and furniture for your use. From the terrace you have a view of the water or the harbour, interrupted only by a promenade. Type NL-1131-06 (180 m2) is a link-detached upper-level home spread across two storeys. The entryway is located on the first floor, so can only be accessed via a staircase. You have six bedrooms (two on the first floor and four on the second floor), two bathrooms (both on the second floor) and a total of four toilets. Both accommodation types are fully equipped and comfortably furnished. You have a dishwasher, microwave and WiFi (available for a fee) and at least one of the bedrooms contains a TV. There is a parking near the object.